People judge many things visually. They use the sensation aroused by textures-a concept called shitsukan in Japanese. A product imparts charm when has a premium feel and is beautiful: shitsukan reaches those people who can see it. In a factory, experts judge product quality by looking at the differences in shitsukan. Yet it is very difficult to clearly describe the exact shitsukan of a product, and the way it appears can be ambiguous. Consequently, artistic designers often fail to convey their desires i.e. how the product will feel, to industrial designers, and experts are always called in to carry out product inspections because the target production finish is difficult for regular employees to grasp. To solve these issues, you need to find a way to clearly describe what is unclear. Shitsukan is essentially ambiguous and it is difficult to express in words. Yet Ricoh is able to quantify it and define it clearly using numerical values. Artistic designers struggle to communicate the exact specification of the visual sensation they were after and ended up using ambiguous words. 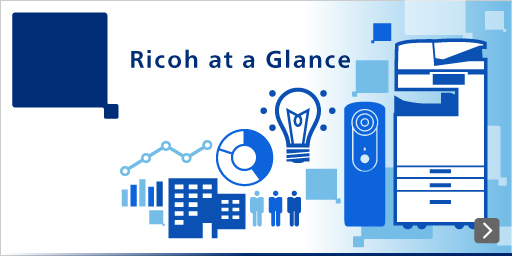 Ricoh helps them convey their desires more clearly to those involved in downstream processes. Irregularity can spoil the beauty of an individual product. Generally, inspections for irregularities depend on the visual capabilities of the inspector. This process can however be replaced with a value-based inspection, which helps stabilize the quality of the finished products. Beauty is simple as a word, however, beauty is also complex and involves a variety of visual information e.g. "no rough surfaces" or "no blurs". Ricoh has been researching the clarity and beauty of printed materials for many years. As a pioneer in the measurement of visual information and the related sensation it produces, Ricoh can now clarify and quantify visual information that arouses the feeling of beauty and excellence of an individual product. Ricoh has been developing optical technologies and imaging technologies and uses them to accurately measure the reflective light from an object, thus extracting the characteristic quantities required for measuring shitsukan. Human sensibility is ambiguous and hard to quantify. Yet Ricoh has successfully quantified the ambiguous visual sensibility of an individual using psychological evaluation. Ricoh has established an algorithm for predicting visual sensation quantified through psychological evaluation using the characteristic quantities obtained through physical measurement. The quantification algorithm incorporates a model of human recognition and visual sense and yields evaluation values that correlate highly with visual sensation. By developing and offering shitsukan measurement devices, Ricoh aims to support creation of both beautiful and high quality products and thus contribute to the creation of a rich society where products of high sensual value are produced.